Warm Your Pockets, Or Tempt Fate With The Pocket Heater | OhGizmo! 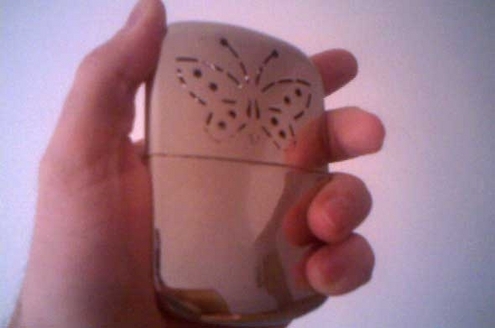 The Butterfly Heater is a (very manly) personal heater that uses a process called platinum catalysis to produce a constant flow of warm air, which is pumped out through the (very manly) butterfly pattern and into whatever part of your body would require heating via a (very manly) personal heater. The process uses lighter fluid, which it evaporates to combine with oxygen and create an allegedly flameless heat source. Seeing as this will be going in your pocket, or some other such closed environment, we’d rather make sure there is no flame at all, which is why we recommend you give it to your little brother to test first. One ounce of lighter fluid will fuel the thing for up to 24 hours. Again, we can’t vouch for any of this, because our suicidal tendencies do not include self-immolation. Don’t let that mess with your groove. If you do order it and survive, please let us know how it went. It’s $18 or $30 for two. Also, see this page for a “history” of the thing. This is a pretty old technology. I have one that is about 40 years old (no it doesn’t have butterflies on it) and it works great. I use for skiing. Theres one of these in my basement, been there probably 20 years. No butterfly though. And if I were to use it, I would hope that my friends, or strangers, would call me a nancy. Umm, no thanks. Combustion is generally not a good thing when it occurs in one’s pockets. I have had multiple units (again with no butterfly) throughout the years. They have kept me warm on ski trips, snowmobiling, and hunting. They acually work great and are nothing to be afraid of.